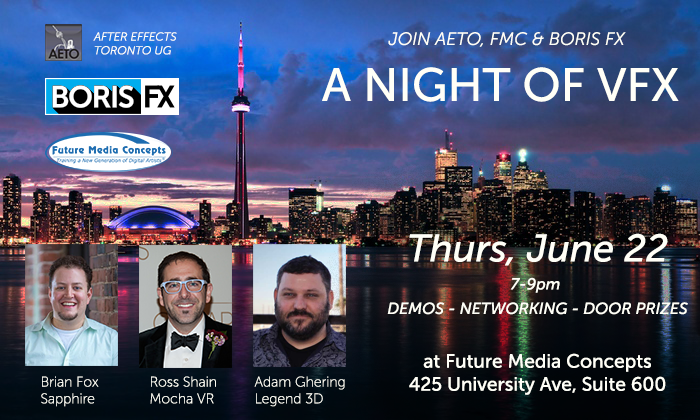 Please join AETO, Boris FX, and FMC on Thursday, June 22 for a night of VFX presentations, networking, refreshments & prizes. Featuring Sapphire, Mocha VR and special guest artists from Legend 3D! Sapphire: Brian Fox, Director of Product Marketing for Boris FX, will present Sapphire Visual Effects plug-ins for After Effects. Topics include an overview of the top Sapphire effects for AE, an introduction to the Sapphire Effect Builder, and a sneak peek at the upcoming release of Sapphire 11, which features integrated Mocha tracking and masking. Mocha VR: Academy Award-winning product designer, Ross Shain, will discuss 360 video post and present Mocha VR. Mocha VR was developed for cinematic VR workflows; tools for planar tracking, masking, removing camera rigs, stabilizing camera motion, and more. Mocha VR works as a plug-in for Adobe After Effects, Premiere, Avid, and OFX. Door Prizes: Attend for a chance to win software prizes! Giving away Boris Continuum, Sapphire, Mocha Pro & more!